Decoy Barn01493 488222work Guest AccommodationDecoy Barn in Fritton, Great Yarmouth is a 200 year old converted barn with many original features and a warm, welcoming atmosphere. All rooms are on the ground floor with lovely views across Fritton Lake Country Park and direct access to the landscaped south facing gardens with your own garden furniture. 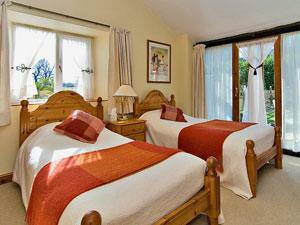 All rooms are ensuite and beautifully appointed, some rooms are in our converted stables. Situated on the A143 Decoy Barn is ideally situated to tour the Broads and other places of interest locally and is just 25 minutes from historic Norwich. Decoy Barn in Fritton, Great Yarmouth is a 200 year old converted barn with many original features and a warm, welcoming atmosphere. Check in is usually from 4pm onwards but can be changed by prior arrangement. Caldecott Health Club, Spa and Golf Course just 2 minutes away in car. Fritton Arms and country park 500 yards away. Decoy Barn Public House opposite Children welcome from age 10. Decoy Barn is situated 6 miles from Beccles and 5 miles from Great Yarmouth on the A143, opposite the Decoy Tavern in Fritton. Please note that there is a 21cm step over into the shower. Unfortunately this means that no bathrooms are therefore suitable for persons bound to their wheelchair.